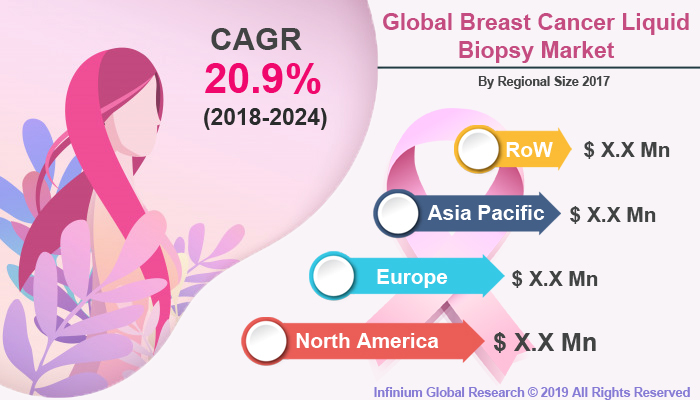 A recent report published by Infinium Global Research on breast cancer liquid biopsy market provides in-depth analysis of segments and sub-segments in the global as well as regional breast cancer liquid biopsy market. The study also highlights the impact of drivers, restraints, and macro indicators on the global and regional breast cancer liquid biopsy market over the short term as well as long term. The report is a comprehensive presentation of trends, forecast and dollar values of global breast cancer liquid biopsy market. According to the report, the global breast cancer liquid biopsy market is projected to grow at a CAGR of 20.9% over the forecast period of 2018-2024. The liquid biopsy in breast cancer is the process used to detect and analyze blood samples of the cancer patients. A liquid biopsy allows the patient to treat according to the biology of their tumor. This biopsy used in the breast cancer treatments is also known as circulating tumor DNA (ctDNA) analysis. At present, the use of liquid biopsy in cancer treatment has a great positive impact on survival rates. Rapidly growing occurrence of cancer is the major factor that driving the growth of breast cancer liquid biopsy market worldwide. Breast cancer is the second largest cause of death across the world. According to WHO, it is estimated that 627,000 women died from breast cancer in 2018 that is approximately 15% of all cancer deaths among women. Additionally, the liquid biopsy is the best suitable alternative to conventional breast cancer treatment. Thus, the rising preference for Noninvasive procedures is contributing to the growth of this market. Furthermore, the factors such as ongoing technological advancements and increasing inclination towards personal medication are anticipated to boost the demand for liquid biopsy in the breast cancer market in upcoming years. However, the less awareness about liquid biopsy treatment is expected to hamper the market growth. Moreover, various government organizations across several regions are taking initiatives to promote this technology that is projected to create several opportunities in this market in the upcoming years. Rapidly increasing funding for the research and development of cancer treatments are likely to create a huge demand for this market in upcoming years. Regionally, North America is the largest market in the breast cancer liquid biopsy flowed by Europe. It is expected to be the dominating region over the forecast period. The major factor that drives the growth of this market in the North America region is the high incidence of cancers in this region. Additionally, the ongoing research and developments in cancer treatments and the growing inclinations towards the non-intensive treatment are favoring the growth of this market. Additionally, Asia Pacific is the fastest growing region in this market owing to the growing occurrence of breast cancer, rapidly increasing population and growing healthcare infrastructure. The report on global breast cancer liquid biopsy market covers segments such as biomarker, and end-user. On the basis of biomarker, the sub-markets include extracellular vesicles (EVs), cell-free DNA (cfDNA), circulating tumor cells (CTCs), and other circulating biomarkers. On the basis of end-user, the sub-markets include hospitals and physician laboratories, reference laboratories, and other. The report provides profiles of the companies in the market such as Isogen Life Science, GUARDANT HEALTH, INC, Biodesix, Inc., FLUXION BIOSCIENCES, Thermo Fisher Scientific Inc., Genomic Health, Cynvenio Biosystems, Inc., Illumina, Inc., Menarini Silicon Biosystems, and Myriad Genetics, Inc.. The report provides deep insights into the demand forecasts, market trends, and micro and macro indicators. In addition, this report provides insights into the factors that are driving and restraining the growth in this market. Moreover, The IGR-Growth Matrix analysis given in the report brings an insight into the investment areas that existing or new market players can consider. The report provides insights into the market using analytical tools such as Porter's five forces analysis and DRO analysis of breast cancer liquid biopsy market. Moreover, the study highlights current market trends and provides forecast from 2018-2024. We also have highlighted future trends in the market that will affect the demand during the forecast period. Moreover, the competitive analysis given in each regional market brings an insight into the market share of the leading players.